So I missed Father's Day. sorry guys. Actually, I worked that weekend and was in my usual "post-call" fog being selfish I guess, and unmotivated. Anyway, I cherish my husband for what a strong, faithful, patient man he is. He didn't even get mad at me for accidentally throwing his 'carburetor thing' , for his truck, in the burn barrel. God really knows what he is doing when he puts two people together. Brian completes me in so many ways that I am not able. Patience for example. I missed Pastor Gary's sermon, but I imagine it was fully charged and motivating for our men to step up. For those that went to see Chonda Pierce, you might remember the opening comedian. He made a joke about how sweet and inspiring most pastor's are for their Mother's Day sermons and then WHAM! they lay it on thick and harsh for the men. It seems true. I sometimes think about this, in light of my husband. It must be a huge burden on him sometimes knowing the responsibility he holds for our family. It reminds me to pray harder for him and when he may not "step up" to my expectations, I may have only myself to blame. 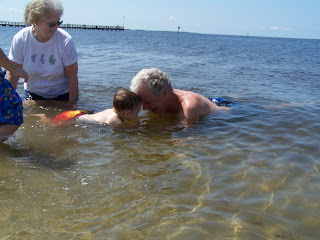 Much thanks and admiration to my dad, who is learning to be a grandpa. It is a stressful job sometimes but with a little help he is doing a great job and the boys really love to hang with him. 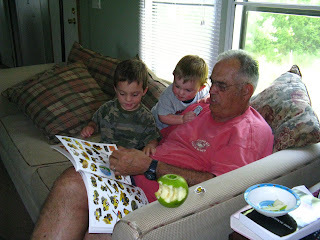 They affectionately call him "papa" and Brian's dad "pappoo". It helps to tell them apart. Hats off to dad Borges in CA. 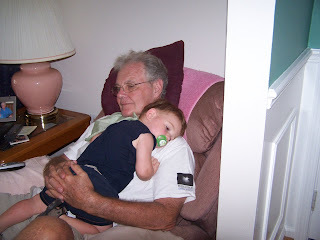 Even after 11grandkids, he is holding strong and very patient. It is more and more difficult not seeing him more often but we make the best of it. By the way, he has started his hormone therapy for his prostate cancer and feeling well. He is trying to modify his diet too, which would be a struggle for most of us, I am sure. We are so excited to go out to see them for a Borges reunion in Aug. It'll be fun to be there for our anniversary and see them before the baby comes. Only 4 more months! that is crazy. I am not sure I am ready but trying to take it as it comes and not stress over silly things, I'd usually stress over. That has been hard. 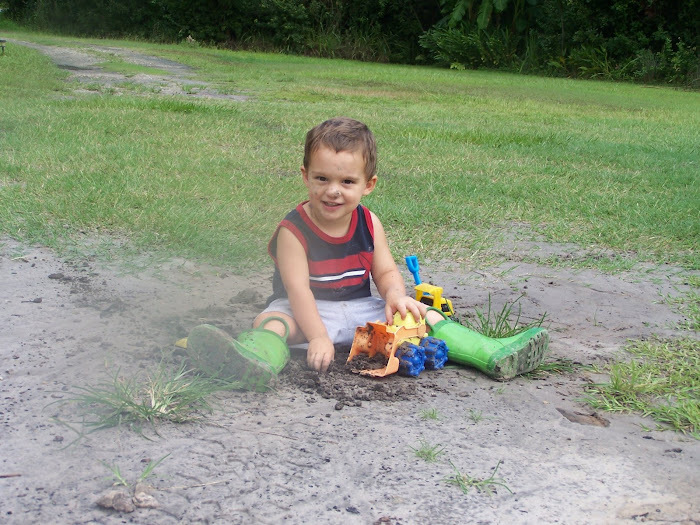 I think it is really true that God blesses us with children as a way to improve our attitudes and behavior. I am learning that I have very long way to go to be more like Jesus. 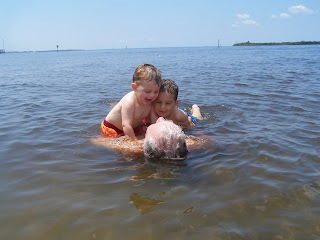 We spent some time with papa and grandma Stalnaker a few weekends ago and the kids had a great time. My parents live near the harbor and many canals surround them, where many canoe and fish. The beach is 20-30 min. away but we decided to make it simple and hang out at Pt. Charlotte "beach", basically the harbor. But it was fun and the boys didn't know the difference. I posted a few pics from our visit. 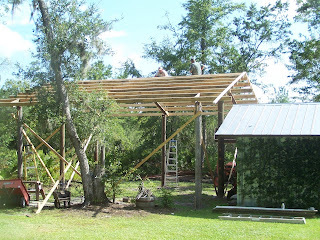 Brian is finally getting to build his pole barn. We've put it off for various reasons; money and time being the most obvious. Anyway, he started on it this week after gathering the materials over the past year. I guess if we had the money, he would've gone the week before and bought everything, but again Brian is patient and he sought out any deals he could find. Last Fall the electric company put in new power poles along our main road and conveniently God placed them in our path and he was able to get the poles they would've gotten rid of. This may be against the law, and I could be getting him in trouble but we totally give God all the credit for that. And, he found other materials for great deals and our neighbor is an angel sent from Heaven, and a carpenter and graciously lends a hand whenever we need it. Hopefully, Brian will have a better place to work on tractors and such and might possibly find himself working for himself one day. That's a continued prayer of ours. So, I love these great men and my boys. It seems I am surrounded by boys. It might actually be strange if this baby is a girl. I know she and I would be wonderful pals that's for sure. And, I might actually have a shopping partner. Nice tribute to the men in your life! When will you be in Ca? You probably told me the dates but I forget. Funny that we are now communicating through your blog more often than voice mail, almost. Hee-hee.